Think for a minute about your grandkid’s grandkids. Where are they living? Perhaps you momentarily considered the possibility of your intrepid descendants dwelling in outer space. You’re not alone: since 1991, when the Space Life Sciences 1 mission was launched (SLS-1), there has been intensive research into the physiological effects of microgravity and space travel on the human body. However, studying the effects of space travel on human development and physiology can be expensive and dangerous. For example, NASA cannot send babies to space to study human development in microgravity (despite the fact that this might be one giant gurgle for mankind). To circumvent the challenges associated with rigorously studying physiology in space, innovators like Dorothy B. Spangenberg and her research team found a way to address whether growing up in space changes how we sense gravity. How? Jellyfish. Jellyfish at the New England Aquarium living its best life. Jellyfish aren’t actually fish at all, they are simple invertebrates, found in the same phylum as sea anemones and corals. Jellyfish are such weak swimmers that they are often at the mercy of ocean currents, which they rely on to move them around the ocean. However, like most organisms, jellyfish require a way to spatially orient themselves, especially with respect to Earth’s gravitational field. In order to sense which way is up, jellyfish develop sensory structures called rhopalia at the base of their bells as they mature. These sensory organs contain heavy calcium sulfate statolith crystals. As the jellyfish rotates with respect to the force of gravity, the heavy crystals tumble in the direction of the gravitational force, a movement which is sensed and interpreted by sensory cells in the rhopalia. These jellyfish gravity sensors are not so different from our own. Our ability to orient ourselves is governed by the vestibular system, located within our inner ears. Similarly to the jellyfish, we sense linear acceleration (such as the acceleration due to the force of gravity) through an otolithic membrane. This membrane picks up the movements of otoconia, small protein/calcium-carbonate particles, in response to gravity. Though the human vestibular system develops during late embryonic stages, jellyfish develop their rhopalia over only five days. This makes jellies a useful organism for studying the effects of microgravity on the development of gravity sensors. 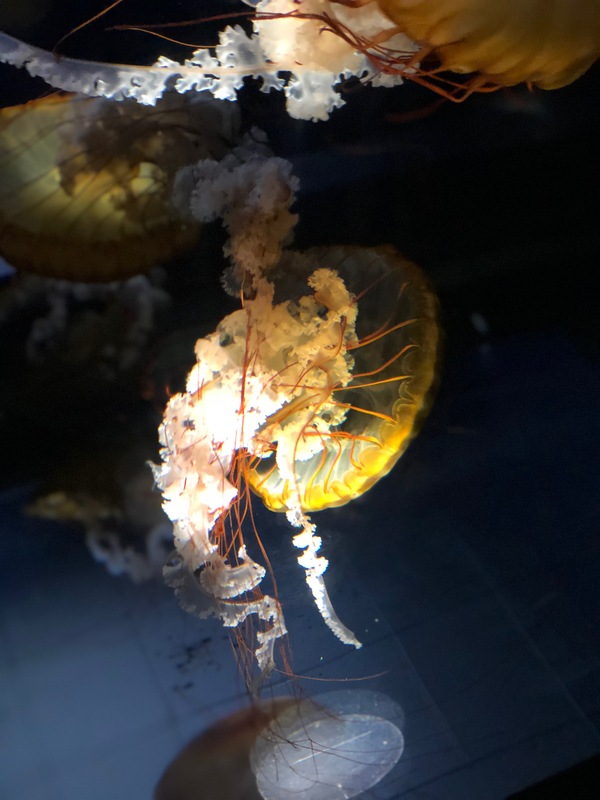 Information about the development of gravity sensors in jellyfish in space could give us insight into an astronaut’s otoconia and even how our grandkid’s grandkid’s vestibular system would develop in response to growing up in microgravity. To perform this experiment, Spangenberg and colleagues sent 2,478 immature jellyfish polyps into space in containers of artificial seawater. By injecting hormones into the seawater bags, the researchers could force the jellyfish to advance to the next step of development: the ephyrae phase where rhopalia (gravity sensors) are developed. They created two populations of ephyrae: jellies that were induced to develop their gravity sensors on Earth and jellies that were induced to develop gravity sensors in space. The physiology of the statoliths and the movements of these two populations of astronaut jellyfish were then compared with jellies that developed normally on Earth. Spangenberg and her team found that the jellyfish who developed gravity sensors on earth and then were subsequently sent to space lost statoliths in space more rapidly than the jellies who never went to space, which may have implications for Earth-born astronauts. Jellyfish induced to develop gravity sensors once they were already in space had no trouble pulsing and swimming in space, and had typical numbers of statoliths. What happened to the space-developed jellies when they came back down to Earth? The researchers reported that 20% of the microgravity jellyfish had trouble pulsing and swimming once back on the Blue Planet, despite having seemingly normal statolith development. Therefore, we should proceed with caution when dealing with how other organisms, including human beings, might develop in space. Although more experiments are needed to determine whether the findings in jellyfish can translate to human development in space, these studies indicate the potential impact space travel can have on how we sense gravity. Jellyfish who developed in space appeared to experience intense vertigo once they were back on earth — so don’t be too jelly of their all expenses-paid trip into space! Authors note: I found out while writing this that a group of jellyfish is called a “smack” of jellyfish, a fact which is far too cute not to share here.